If there’s one thing RealGaming Nevada has been consistent with, it’s their constant unveiling of unique promotions. The online poker room has come up with all sorts of ways to attract new players, and each new promo gets a little more interesting than the last. RealGaming’s latest incentive is called Happy Hour, where Real Score points are multiplied up to 6x and table starters get $20 an hour. Happy Hours at RealGaming occur every day, twice a day, from 2:00am to 5:00am, and again from 2:00pm to 5:00pm. These are generally off hours for any online poker site, so what better time to encourage more cash games? Let’s take a look at the two ways members of RealGaming can benefit from the Happy Hour promotions. Paying people to play poker isn’t exactly unheard of. Las Vegas casinos used to (and surely still do) employ professional players to get new cash games going. The player would receive a handful of free chips to sit at a table and get other players in the action. Any money the player won from the free starting stack was theirs to keep. That’s not exactly what RealGaming is doing with its Happy Hour promotion, but it’s a solid comparison. 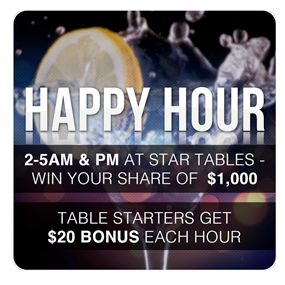 During each hour of Happy Hour, RealGaming is giving $20 to the first three table starters at any Star table. The player must be actively participating in the game for at least 90% of the hour to qualify for the $20 reward, and up to three players per table are eligible. The first three players to achieve 90%+ play time in the hour at that table will qualify. Players who enter real-money cash games at RealGaming during Happy Hour will have their Real Score multiplied by up to 6x the normal amount, depending on how many players are active at their table. If there are 2-3 players seated, Real Score is multiplied by 2x. With 4-5 players, everyone’s Real Score is multiplied by 4x. If 6 or more players are present, the Real Score is multiplied by 6x. The next obvious question would be; what’s so great about earning Real Score? When an online poker player contributes to the rake at a cash game, they earn what’s called a Tier Score. These Tier Score points are used to release bonuses and track a player’s VIP Tier Status. The amount of Tier Score earned also determines a player’s Real Score. New members of RealGaming start at the Bronze Tier, which instantly gives them a 2.5x multiplier on Real Score. A higher Tier level grants a higher multiplier, up to 15x for Diamond VIPs. For example, a Bronze member contributing $1 to the rake would receive a Tier Score of 2, which is multiplied by 2.5x to deliver a Real Score of 5. If playing at a Star table during Happy Hour where 4 players are seated, the Real Score would be multiplied again by 4x, delivering a total Real Score of 20 for contributing just $1 to the rake. Now for the real kicker – you can turn Real Score into cold hard cash. Every 100 Real Score is worth $1 in cashback. Due to the overlapping multipliers applied during Happy Hour, a player could stand to earn a great deal of cash at RealGaming, especially if they are eligible for the additional $20 table starter reward.